The first ever National Obesity Care Week launches today—November 1st, and continues through November 7th. This week-long campaign is designed to raise awareness and advocate for those affected by obesity. It is the beginning of a much-needed national conversation about a complex health condition that affects over 105 million Americans. Over 35 collaborating organizations have signed on as supporters. Ignite a national movement with a united focus to ensure anyone affected by the disease of obesity receives respectful and comprehensive care. In its inaugural year, the campaign is targeting healthcare professionals. It advocates for change in the way medical professionals care for those with obesity. I couldn’t be happier to hear it! As you know, it is my mission to raise awareness about obesity among medical professionals and across the country. National Obesity Care Week provides clinicians with effective, science-based, compassion-based tools and resources that will help them actively engage with their patients living with obesity. You can support it too by spreading the word about the campaign. 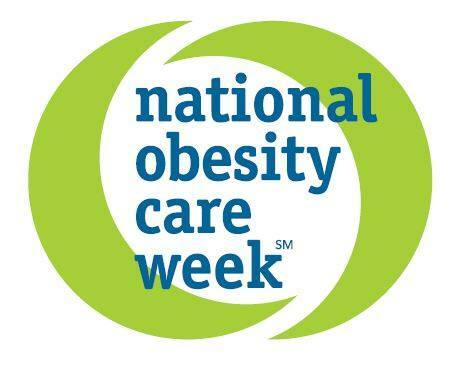 You can follow Obesity Care Week on Twitter, Facebook, and LinkedIn. The stigma and obesity bias are harmful to the health and well-being of all those affected. National Obesity Care Week hopes to change that. It was a beautiful day…for the OMA. On October 2, 2015, the American Society of Bariatric Physicians became the Obesity Medicine Association—the OMA. As clinical leaders in obesity medicine, our 65 year old organization needed to shed its outdated name and tell the world who we are. At our fall conference in Washington DC, we stood together and unveiled our new identity. But it wasn’t just a beautiful day for the OMA, it was a beautiful day for those affected by obesity. Our new name makes it easier for people to find clinicians with specialized knowledge and a respectful approach. It attracts medical professionals who want clinical education and support. It makes comprehensive, science-based care more accessible. It expands OMA’s influence locally, nationally, and across the world. It opens the door to health and possibility for the millions who are affected by obesity. It’s that time of year when we are all abuzz with gift giving. Driven by our innate desire to give, we are in hot pursuit of the best gift for everyone on our list. And out of pure generosity we throw in pleasing others by doing, inviting, attending, and bringing. It’s all great fun, but if you aren’t paying attention, it can bump you right out of your healthy routine and into the arms of temptation. You skip your walk in lieu of sleuthing for gifts, or forgo sleep to attend a holiday gathering. In all the frenzy you forget to plan your snacks. Then in a moment of sheer exhaustion—and hunger—you reach for that sweet morsel. Before you know it, many sweet morsels have passed through your lips. Now you are possessed by cravings and all you can think about is your next fix. Faster and faster you go, trying to do it all. But you haven’t eaten well or exercised or slept enough. You are crabby and irritable. Family members and co-workers dive behind furniture when they see you coming. So much for spreading holiday cheer. You reach for another cookie. This is the tradition many of us have practiced year after year: Focusing solely on the gifts we give others, neglecting our self-care, and arriving on January 1st, dragging our regrets behind us. Luckily, it’s only mid December. There’s still time to retire the traditions that deplete you and create ones that empower you. He walked out onto the stage to give his talk, all 6 foot 7 inches of him. I noticed that he didn’t stand behind the podium, but walked in front of it. No jacket, with his sleeves rolled up. I liked his more casual approach. The title of his presentation was “Update From Sweden.” Sure it was exciting that Dr. Andreas Eenfeldt had come all the way to Philadelphia just to speak at the American Society of Bariatric Physicians spring obesity conference, but how different could things be in Sweden? After a full day of hearing more evidence about the clinical benefits of low-carb eating for those who are overweight or obese, I didn’t expect anything revolutionary. But always eager to learn, I gave him my full attention. Using a clever chart in the shape of a pound of butter, he showed that butter consumption in Sweden decreased by 232% from 1985 to 2005. Just like Americans, the Swedes had been told that low-fat, high carb eating is the healthiest, particularly for those who are overweight or have high cholesterol, heart disease, or type 2 diabetes. The chart also showed that during this period, obesity went up substantially. Just like it did in the U.S. Nothing I didn’t already know. Bad medical advice can cross oceans and be kept alive for decades anywhere. A photo of a smiling Swedish woman wearing a white lab coat flashed up on the screen. Dr. Annika Dahlqvist was one of the first physicians in Sweden to prescribe low carb diets to her type 2 diabetes patients. Her results were amazing, with person after person losing weight and improving diabetes, high cholesterol, high blood pressure, and a host of other chronic medical conditions. Despite these spectacular results, some dieticians reported her to Sweden’s National Board of Health for using a “fad diet” that veered from traditional practice. An official investigation was launched. I went back to knitting my scarf, but continued to listen. I just couldn’t bear to see what was coming up next. I looked up and there he was, hammer in one hand, big shiny nail in the other, poised to deliver his first blow. Now I get why Dr. Dahlqvist’s smile was so big. For nearly a decade I have recommended low-carb diets to my overweight and obese patients and have had the same results as Dr. Dahlqvist: Weight loss and improvement of metabolic conditions such as type 2 diabetes, high blood pressure, high cholesterol, and numerous other chronic conditions. Although the evidence wasn’t new to me, discovering that things had improved so dramatically for an entire country was BIG news to me. And it gave me hope that our medical system will finally retire the harmful low-fat dogma that was never based on science and recommend evidence-based low-carb diets as treatment for overweight and obese persons. The Swedish Council on Technology Assessment in Healthcare—an independent governmental agency—spent two years examining the evidence for low-carb diets. In October 2013 they issued their report: Dietary Treatment for Obesity: A Systematic Review of the Literature. They concluded that low-carb diets are more effective than low-fat diets for reducing weight, lowering glucose levels, and improving cardiovascular risk markers. For more details about this report, check out Dr. Eenfeldt’s blog. Do you think it’s time to lower the coffin into the ground? Please visit my blog and tell me what you think. If you’ve had success with eating low-carb, I’d like to hear about your experience. Welcome to the premiere issue of Inspiring Health! At long last it is here. I hope that you will find what you are looking for. Along with some of what you may not have expected. Here in Seattle there are hints of spring everywhere. The tree buds are swelling, pregnant with life that is eager to burst forth. Some have already given birth, their glorious pink and white blossoms clinging to bare branches that shoot up into the sky. Crocus and primrose are splashing color wherever they can, tantalizing us with promises of warmer, brighter days. And the green tips of the daffodils, hyacinths, and tulips are pushing their way out of the wet earth. Like soldiers all lined up for duty, they are preparing to amaze us with their masses of heady color. After the dark of winter, these are welcomed signs. We are ready for light and new life. But nature is not the only one renewing herself. Spring cleaning season is also well underway. Every day I hear stories of people decluttering their homes of possessions that have been weighing them down for years. Boxes are being filled with items to throw away, give away, or archive for posterity. As these folks release what no longer serves them, they are making room for new growth and insights. And they feel great as a result. It is inspiring to witness. The promise of possibility is everywhere. Might I suggest adding something else to the spring cleaning list? Far too many minds are cluttered with inaccurate, out-dated beliefs about obesity and the health issues related to excess weight. Shame, blame, finger pointing, and “the need to take personal responsibility” are all touted as the best motivators and have contributed to a weight stigma that is paralyzing. Shame, blame, and finger pointing have contributed to a weight stigma that is paralyzing. Unfortunately, such attitudes are prevalent on many fronts—society at large, the medical community, and especially within the minds of those struggling with excess weight. Prevalent as they are, they are not helpful. And they are weighing us all down. Let’s purge the attitudes and beliefs about weight issues that no longer serve us. We’ll throw out the diet books and the easy ten-step plans. We can simply take them off the shelf, wipe it down, and create the space for new concepts and ideas to reside. With our brooms in hand we will reach into every corner and sweep out old myths. We’ll toss the blame and clean out the cobwebs of shame. Then we’ll open the doors and windows so that light and truth can enter. It’s time to shine a light in the darkness. It’s time to shake things up. It’s time for new growth. It’s time to de-stigmatize obesity and begin a more productive conversation. As we do, our voices will ripple out and create a movement that will make a difference for many. We will change society by speaking out. And we will change ourselves. This premiere issue of Inspiring Health creates a new space—one filled with truth, hope, respect, compassion, and inquiry. Many questions will be asked and many issues will be explored. We will learn much. But there will be no tidy answers. I will discuss topics that will guide you on your journey of health. It will be a blend of nerdy science and psychology, with a dash of big picture thinking. There will be practical tips for creating a healthy lifestyle, along with the inspiration you need to make it happen. I will report on my latest professional conferences and study. Because most of what I know about weight issues has come from my patients, I will share how my clinical work teaches and inspires me. And you’ll get the scoop on where I’m speaking and what I’m writing about. But mostly, I want this to be a place that inspires you to feel your best. I invite you to be in conversation with me. Let me know what topics you would like me to write about. Feel free to share what’s on your mind. I will walk with you. We will do this together. I’m all set to attend the spring conference of the American Society of Bariatric Physicians (ASBP) that takes place later this week in Philadelphia. Being the nerd that I am, our bi-annual conferences are one of the highlights of the year for me. Each conference increases my knowledge of how to help my overweight patients lose weight and live healthier lives. And I will have the opportunity to reconnect with my talented colleagues from across the country. On Wednesday, March 13th, I will be attending the Nutrition & Metabolism Society Symposium. This leg of the conference will explore the latest on low-carbohydrate and carbohydrate-restricted diets and their use in weight management and improving conditions such as metabolic syndrome, diabetes, and cancer. We will hear from leading researchers such as Stephen Phinney, MD, PhD, Jeff Volek, PhD, and Eric Westman, MD, MPH, among others. In addition to educational activities, I will participate in two committee meetings. As co-chair of the Advanced Practitioners Special Interest Group, I will lead our bi-annual meeting of nurse practitioners and physician’s assistants. Our current focus is on increasing the visibility and influence of ASBP and obesity medicine through professional activities, professional networking, and providing clinical education to other medical professionals. As a member of the CME Program Committee, I will meet with the other committee members to develop future conference programs. We will discuss topics and speakers for our fall conference in Austin, Texas and the 2015 spring conference in Denver, Colorado. The new ASBP Mentorship Program that was introduced at the last fall conference will continue in Philadelphia. As an experienced obesity medicine specialist I will serve as a mentor for two nurse practitioner attendees who are new to obesity medicine. It is my role to ambassador them into ASBP and obesity medicine by providing support and advice, and facilitating their connection with other members and leaders. The role of mentor is one of my favorites, so I am really looking forward to connecting with these emerging leaders in obesity medicine. I will have my reporter’s notebook in hand throughout the conference and will share my newfound learning and other juicy stuff when I return.